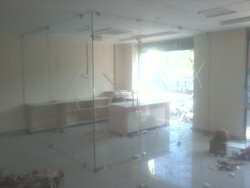 With the help of our expert professionals, we have been able to offer Toughened Glass Partition. 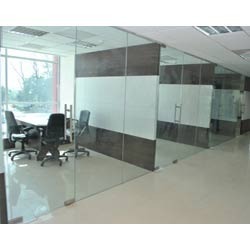 This glass partition is precisely manufactured by optimum quality glass or other allied material in accordance with market norms. 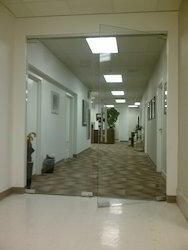 Our offered glass partition gives your office a spacious feel & offers an attractive 'wow' factor to your workspaces. A full length frameless glazed partition system gives your office a spacious feel allowing the maximum amount of light through. 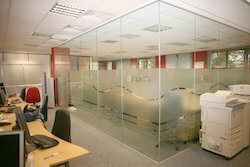 This stylish glass partitioning provides an attractive 'wow' factor to your workspaces. Single glazing can be used where clean lines and an aesthetically pleasing design are essential. The partitioning is designed with the minimum amount of framework to give a frameless appearance. To maintain the open feel of the office environment frameless doors or framed glass doors are fitted within the system using floor pivots and patch fittings or floor springs if required. Dimension/Size 500 - 1000 sq.ft. 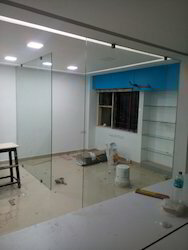 We are the leading retailer and supplier engaged in a wide assortment of Glass Cabin Partition. Offered cabin partition is best suited for use in offices, separation of retail spaces. This cabin partition is designed using quality-tested glass or other allied material as per the requirements of patrons. Our prestigious clients can avail this cabin partition from us at nominal prices. 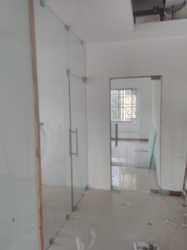 We hold expertise in offering high quality range of Glass Partition. To attain the maximum satisfaction of customers, we provide this product at pocket friendly price. Moreover, we offer this product in customized form. Our organization is committed to offer prestigious customers a comprehensive range of Frameless Toughened Glass. Best for commercial & residential layouts, the offered toughened glass is designed at our manufacturing unit by using quality glass or other allied material in accordance with the set standards. Also, customers can avail this toughened glass from us within the estimated deliver time. Looking for Toughened Glass ?